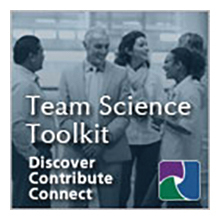 The Annual International Science of Team Science (SciTS) Conference is a forum to enhance our understanding of how best to engage in Team Science to meet society’s needs. The SciTS Conference serves: as a point of convergence for investigators studying Science teams and Team Science leaders/practitioners; to engage funding agencies to provide guidance on developing and managing Team Science initiatives; and to afford data providers and analytics developers insight into collaboration tracking and analysis needs. In this way, the SciTS Conference acts as a bridge between the Science and the praxis of Team Science, serving as an important conduit for translating empirical findings about Team Science into evidence-based effective practices for scientific teams and funders of Team Science. The conference committees for the VIVO Project and Science of Team Science (SciTS) have agreed to jointly hold their annual conferences for the first time. Duraspace, a not-for-profit organization providing leadership and innovation for open technologies that promote permanent access to digital data, is providing hosting support for the conferences to promote synergies between the VIVO and SciTS communities. The conferences will take place in Austin, TX, August 6-8, 2014. This collaboration provides attendees with a unique opportunity to expand and integrate their knowledge of the latest advances across these two complimentary areas of innovation in scientific research. While VIVO and SciTS will offer two primarily distinct conference programs, attendees will only pay one price to have access to all that both conferences offer. Attendees may attend sessions from both conferences, as well as view twice as many posters and meet with more industry vendors than at either individual conference. The conferences will feature joint networking receptions, dining options, breaks, and select sessions for all conference participants to attend. The expanded networking opportunities will be invaluable as attendees will have an exclusive opportunity to learn from each other. If you have questions about the conferences, please contact [email protected] or [email protected].